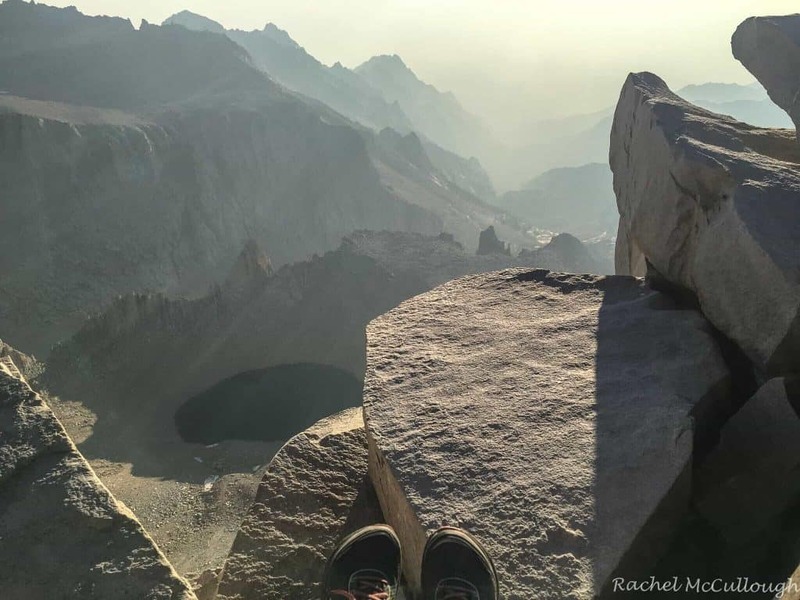 Rachel McCullough is an avid runner, hiker, mountain biker, rock climber, yogi, skier and photographer living in Truckee, CA. 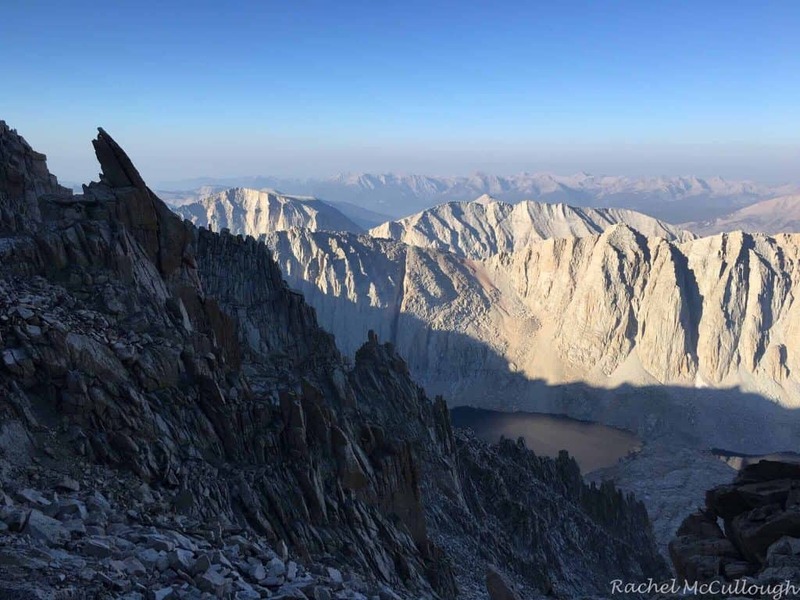 Follow @rachelmcphotos on Instagram for stunning images of beautiful Sierra scenery. 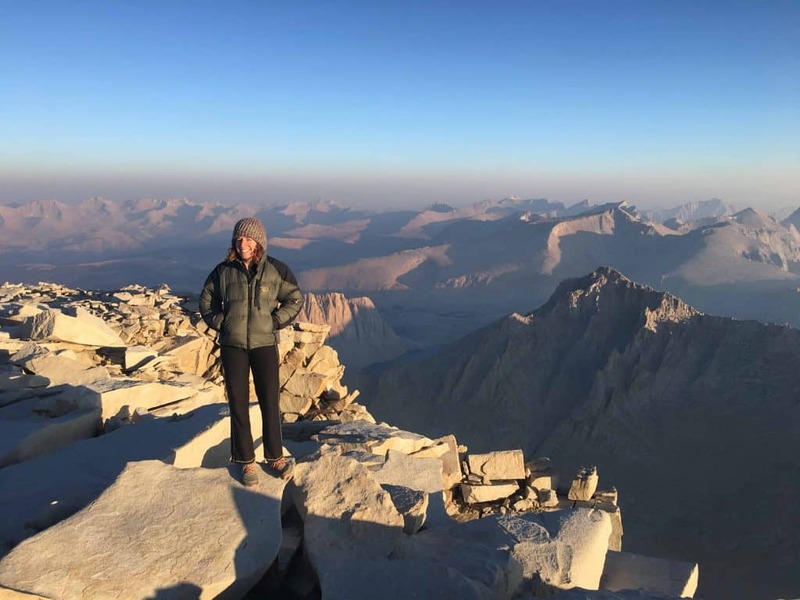 When Rachel isn’t enjoying her free time in the outdoors, she’s teaching skiing at Northstar California or building gorgeous websites for her clients at McCullough Web Services. I spent hours, alone and bleary-eyed, hiking into the darkness. The sliver of fire-orange moon glowed eerily on the horizon as wildfires burned throughout California. Eyes stared back at me, aglow from my headlamp. One pair, then two, then three. They didn’t move. I said “hey” but they still didn’t move. They were right in the trail. I angled my headlamp to try to make out the figures. Deer. Three friendly deer politely moved aside as I proceeded up into the hazy night. Everyone says the Mt. Whitney Trail is pretty much like a superhighway. It’s not, if you start up it at 1am. I hiked for 5 hours, ever so slightly frightened, each time I saw some eyes staring back at me, before I caught a glimpse of the flicker of a headlamp in the distance. That gave me some extra motivation, maybe I could catch up and be the first at the summit that day. I powered up the section called the 99 switchbacks, which is just like it sounds, repetitive short switchbacks up to the crest, at which point, you turn and walk up the ridge for two miles to the summit. Walking up the ridge as the sun rose. Mt. 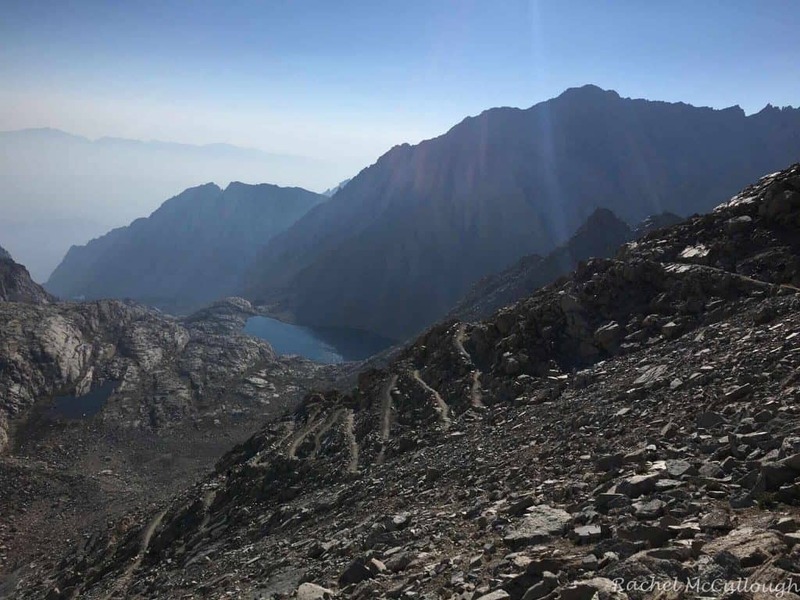 Whitney is the highest peak in the Lower 48 at 14,494 feet and these switchbacks put you well over 13,000 ft. I passed the party I spotted and as the trail crested, I saw dozens of big packs lining the trail, dropped off for the summit push. I realized I would not be the first one up, with many people entering from the Sequoia side. Five hours in the dark is a long time to question many things. Would the sun ever come up? Were there actually other people out here? Where is this super-highway? Were all those eyes actually deer? Are there mountain lions here? Why can’t I remember any words besides “I like American music” and “Do you like American music” to that Violent Femmes song? Why don’t I know the lyrics to any song and how is that possible when I sang along to an entire mix CD on the drive down. Don’t worry, I listened to a mix tape too, just in case you were thinking, CDs, how old school. I guess at 1a.m., with not much sleep, my brain could only figure out how to put one foot in front of the other. The sun made its way up, behind the haze and smoke on the other side of the ridge. 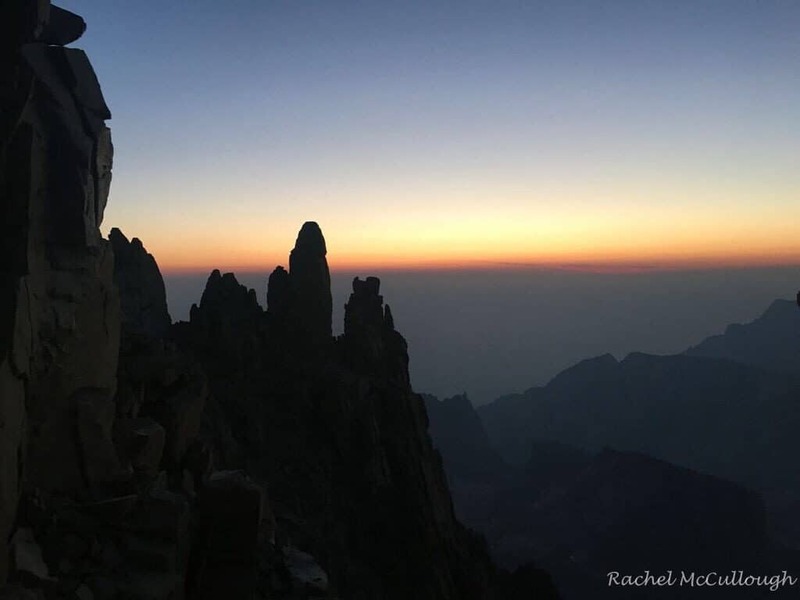 Every so often, I could climb up a few rocks and peek over to the other side, watching it glow redder and redder as the sun rose above the haze and into view. Sometimes the best view isn’t at the summit! I plodded on in the coldest hour of the day, my headlamp still on since my frozen gloved fingers couldn’t work the button. And finally, I could see where I was and what the mountain looked like. Finally, I could see where I’d been and where I was going! The trail never got too steep! What a treat to see all this when it finally got light! I picked up the pace, but really wasn’t moving any faster since I stopped for so many photos. That ended when my cold fingers wouldn’t press that button anymore. Momentarily regretting not bringing handwarmers, I decided to just enjoy the view and keep moving, passing a few parties before reaching a summit full of many others. It was gorgeous, as expected, with the smoke adding to the drama of the jagged mountains and deep blue lakes. I found another guy on his own and we snapped some photos of each other. My hands warmed slightly in a tiny sunny spot and I ate my peanut butter and brownie sandwich. Yum! The warm glow of early morning light on the summit of Mt. Whitney. I sloppily signed the guestbook and headed out, at a fast clip once the short uphill sections were done. Time to get the sunglasses out! Peering over the edge from my snack spot. The 99 switchbacks were now packed with people and I wondered if maybe they were named so for the 99 people you have to pass on the way down. About 10 of the 99 Switchbacks. I found a nice lake off the trail to eat my lunch at (although the clock said it was still breakfast time). Tahoe was calling, so I really picked up the pace, to make sure I was back down well before the 3hour construction delays started. I made sure to look back every once in a while. Goodbye, summit! Before I knew it, I was back in the smoke and walking through the wooden structures that guard the entrance to the trailhead. Although at the time, I questioned whether compulsively refreshing the recreation.gov Whitney permit page, dozens of times a day to look for cancelled permits, was worth it. Now I can say it definitely was. I’ll be back, hopefully, with company. Solo Whitney hike. 21.6 miles. Check. Thanks for taking us along! Beautiful shots.. how cold was it at the top?